Let's be honest: sustainable fashion has a bad rep. When you think of eco-clothing, chances are you're picturing something itchy and shapeless, like a burlap sack. Considering the fashion industry is the second largest polluter in the world after oil, this perception desperately needs to change. 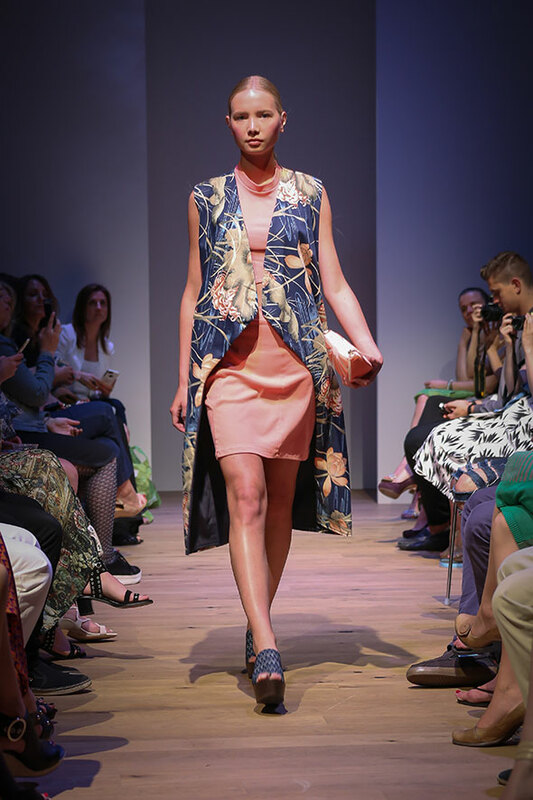 Design Forward, a runway event by non-profit Fashion Takes Action (FTA), recognizes that great design should come first, which is why they feature only the most progressive Canadian designers. Every label is committed to ethical practices like local production, fair trade, zero waste, and the use of organic/recycled materials - without sacrificing style. FTA founder Kelly Drennan said it best: "Nobody will care about sustainability in fashion if it's ugly." 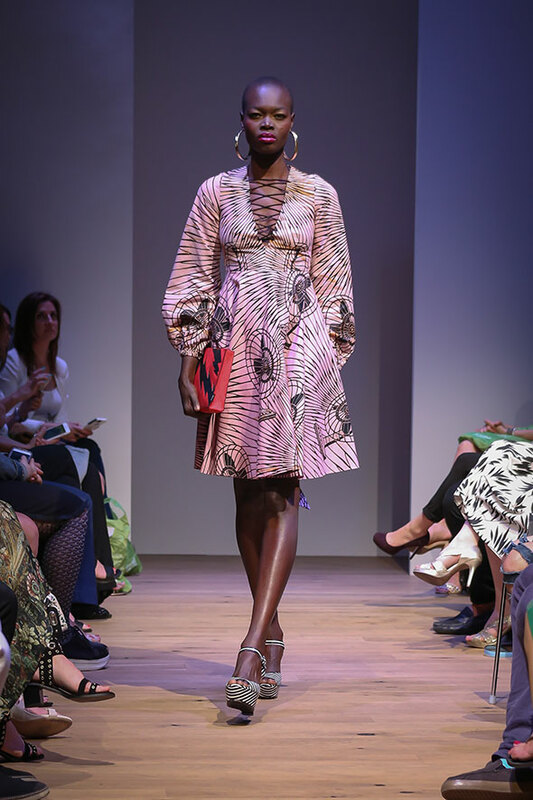 On Thursday night, Design Forward transformed Artscape Sandbox into a runway room akin to Toronto Fashion Week's, hosting influential attendees from the fashion community and supporters of FTA. Here are 13 forward-thinking looks from the runway at Design Forward. Toronto-based photographer, artist and designer Marie Copps repurposed gowns into on-trend eveningwear, without shying away from her signature opulence. Peggy Sue Collection prides itself in working closely with North American farmers, millers, weavers, and tanneries. The pieces are meticulously handmade keepsakes; it's no surprise the brand recently won Toronto Fashion Incubator's esteemed New Labels competition. Asikere Afana garments are inspired by feminine energy, made in Ghana with fair trade and 100% cotton. Playful prints and flattering silhouettes are aplenty in their collections -- this dress decorated with electric fans is no exception. 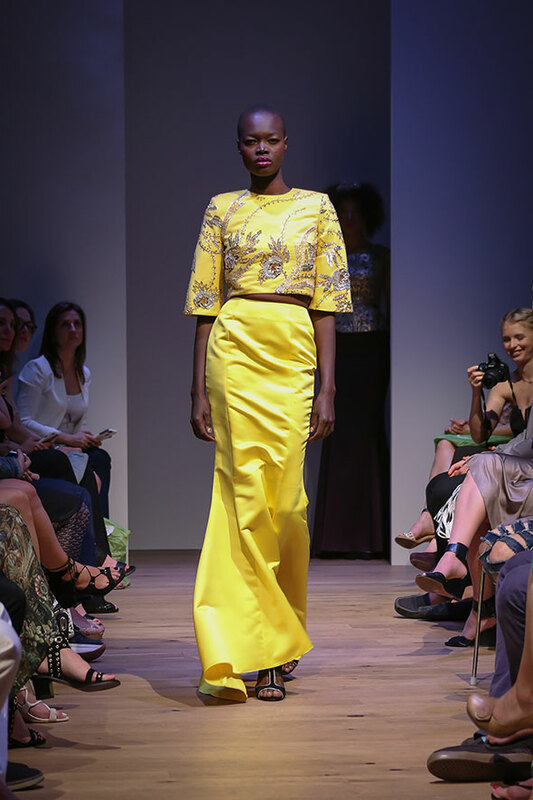 Emerging label Bellantoni showcased trendy looks that were minimal in silhouette yet electric in colour. Committed to using only organic cotton, recycled fabrics or excess materials from large manufacturers that would otherwise toss them in a landfill, sustainability is a driving force behind designer Bianca Bellantoni's creations. 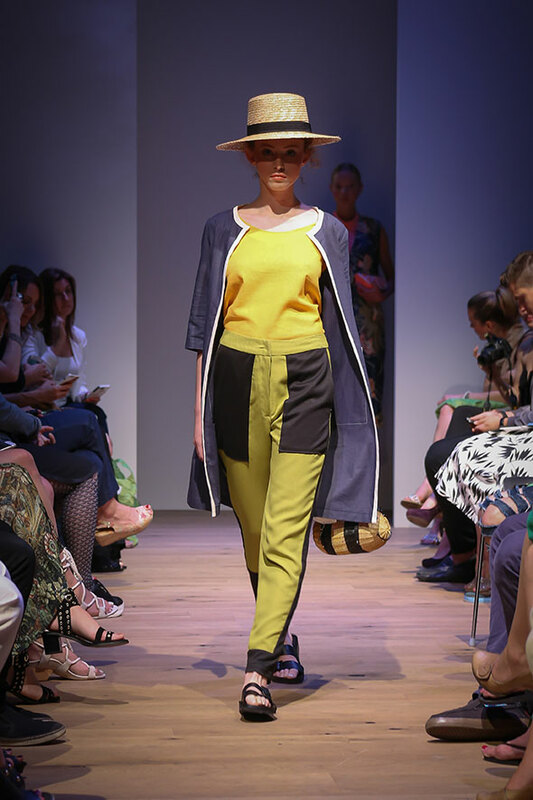 Recent Ryerson Fashion Design graduate Nancy Mac used only natural cotton, linen, and silk in her final collection, sending this colour-blocked look down the Design Forward runway. Elle Made Well creates versatile basics using ethical production and eco-friendly materials. Meant to be ultra-wearable, the womenswear pieces are designed to be lifelong closet staples. Proudly made in Toronto with locally-sourced materials, TMR Collection is known for its super clean silhouettes and quirky cutouts. Annie Thompson calls her work "non-fashion," as fashion is trend-based and forever fleeting. Her pieces instead focus on individual style, made with as tiny of a carbon footprint as possible. Abel is a Vancouver-based brand that employs underprivileged individuals to hand-make their sophisticated womenswear. This shift dress pays homage to the city's oldest neighbourhood through its print and production. Katrin Leblond refuses to sacrifice boldness with her ethically-sourced, Montreal-produced eponymous label. This ensemble, inspired by mermaids, was one of three hyper-coloured looks to walk the runway. Miik's practical basics for men and women uses fabrics made from bamboo in a closed-loop manufacturing system, meaning they reuse energy and chemicals over and over - never dumping them into the environment. Preloved has had sustainability in mind for over 20 years, upcycling fashion right here in Toronto since 1995. Every piece, like this reclaimed peasant blouse, is truly one-of-a-kind. 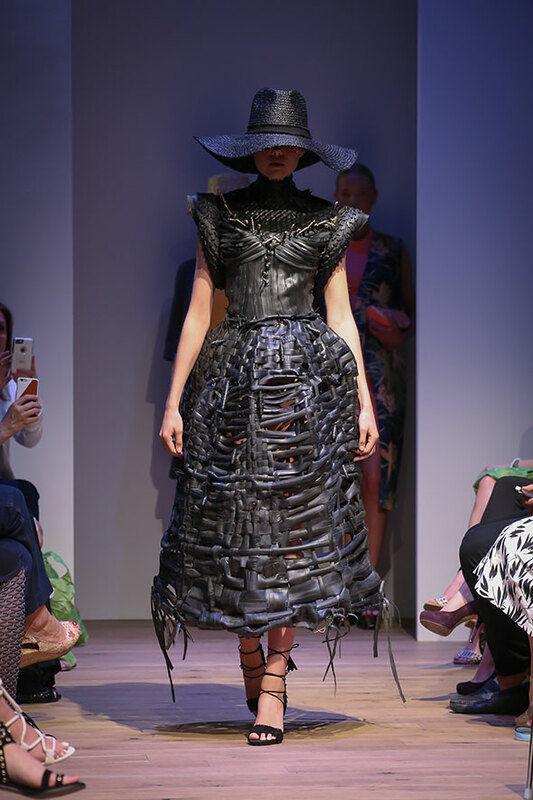 Recent OCADU graduate and emerging designer Julia Yeh wowed the audience with her fairytale-inspired, wearable work of art made entirely from bicycle tubes. Top photo of Preloved. Photos courtesy Anushila Shaw.